If so, let me be your hiking guide on Kaua‘i. I will lead you with confidence to all parts of the island. I've hiked all the trails and know all the paths. I have all the backpacking equipment and outdoor experience to get you there and back safely. Discover hidden gems just off the beaten path. Learn about the geology, flora, and fauna of Kaua‘i. Hear the history, tales, and legends of the places you visit. Get information and tips to make the most of your visit. Full- or half-day hikes optimized and tailored to your ability. Optional transportation from your lodging, 4x4 capable. Multi-day backpacking trips: carry less, enjoy more scenery. 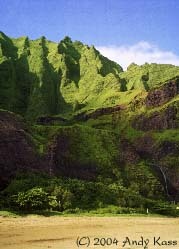 2- to 10-day all-inclusive tours with hikes around Kaua‘i. Custom hikes and tours to satisfy your wanderlust. An innkeeper is like a dancer who must be trained in every movement form. Instead of ballet to hip-hop, however, it's flower arranging to floor polishing, hospitality to fruit harvesting.